This tutorial was written in November 2010. 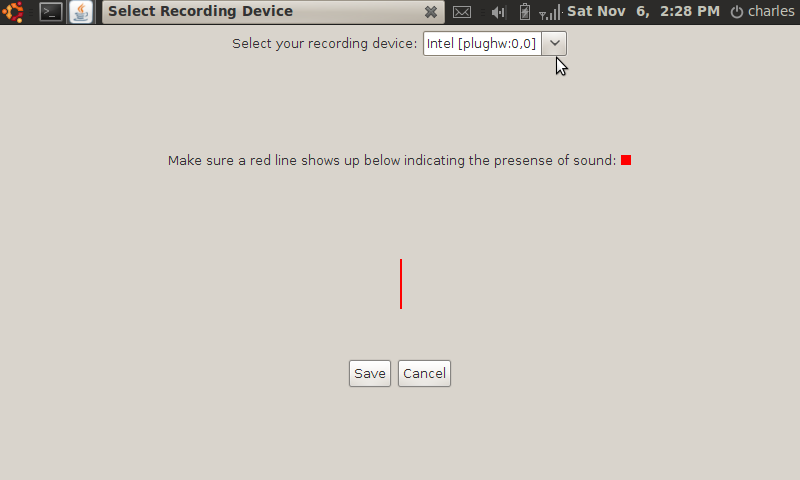 I have spent a decent chunk of time in the last year working with sound recording and playback in Java and I have never been disappointed. There are a few tricks though when it comes to sorting out the complex mixer, port, and line paradigms that programming Java sound entails. When deploying a recording application across different platforms there are also a lot of tiny details that come into play. 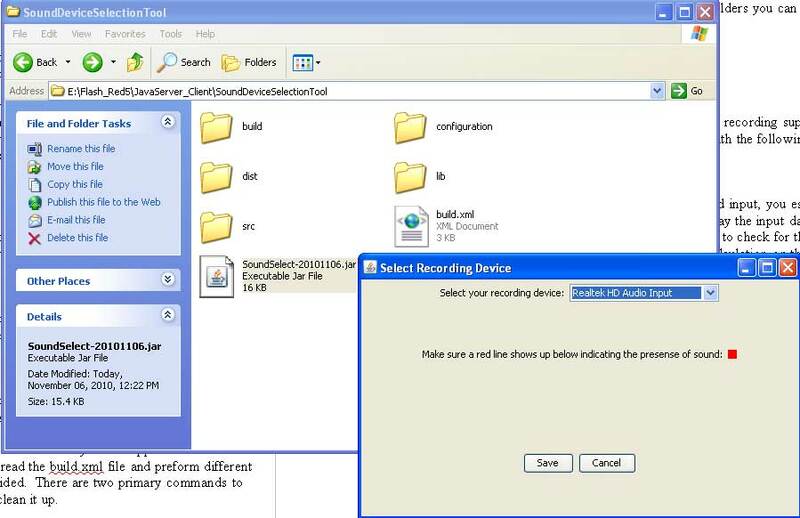 This is a small application that allows the user to view all of the available recording devices on their computer. When choosing between these applications, the input levels are automatically displayed. This application and the following methods have been tested on Windows XP SP3, Windows Vista SP2, OSX 10.5, Ubuntu Linux 9.10, and Windows 7. 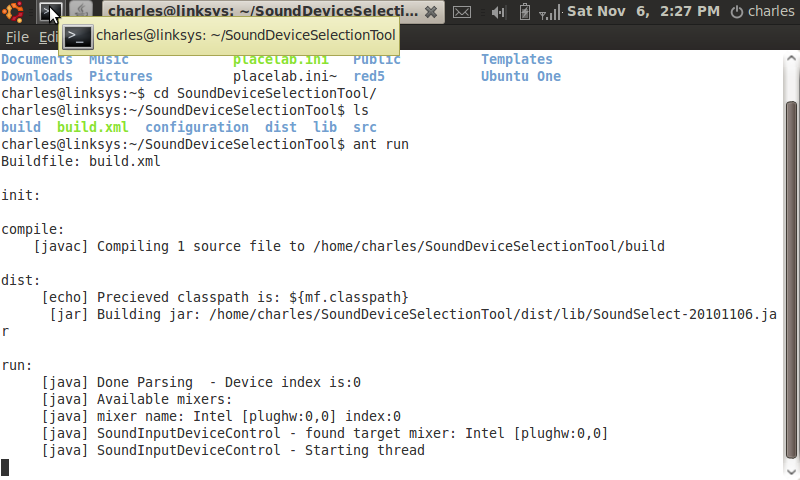 In the main directory of the application you will find a .jar file named SoundSelect-20101106.jar. If you have the Java runtime environment installed, you should be able to double click this jar file and a user interface will appear. 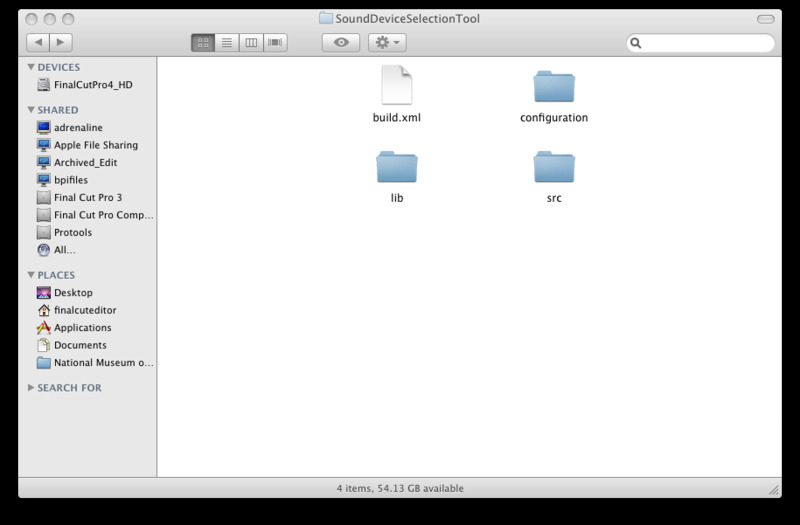 In order to see the terminal/command line output of the application you can navigate to the main directory of this application containing the SoundSelect .jar file as well as the build.xml file and execute the following command java -jar SoundSelect-20101106.jar. This program was built using Apache Ant with the Java 1.6 JDK. When building this application, assuming you have Apache Ant and it is available on your command line (you need to put the path to Ant's bin directory into your system PATH), navigate in the command prompt/terminal window to the main directory of this application. This contains a file called build.xml. Ant will read the build.xml file and preform different actions depending on the commands provided. 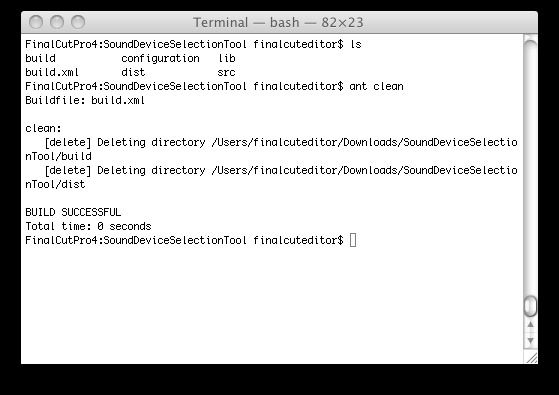 There are two primary commands to compile and run this application, then to clean it up. Running this command compiles the .java files in the src directory, creates a folder called "build" and places the compiled java .class files in there. It then creates a directory called dist then inside of that one called lib, then inside of that an executable .jar file with the current date is created. The clean and run commands are not custom or standard to ant. If you look inside the build.xml file, you will see that I have created targets called clean, run, and several others that preform all the actions. At a high level the src/bootstrap.java file is the main class of this application. First thing, an instance of the configuration file loader: src/com/technogumbo/XMLFileLoader.java is made and parameters are loaded from the file configuration/ClientConfiguration.xml. 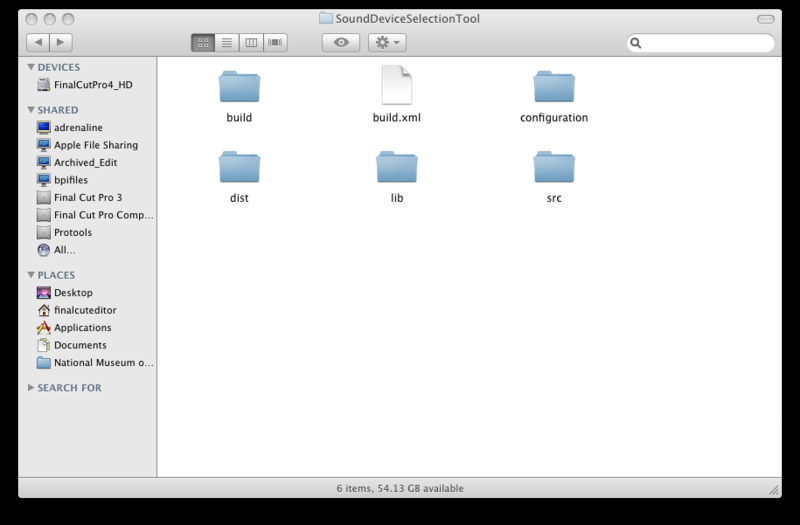 Then instances of the UI (src/com/technogumbo/ui/SoundDeviceSelectionUI.java) and the sound input control (src/com/technogumbo/devices/SoundInputDeviceControl.java) are made. Events are setup to route between these two and bootstrap.java. The selected device automatically attempts to open upon startup of this application. Each time a different item from the drop down is selected, that mixers TargetDataLine is automatically opened. If the user presses the "Save" button, the XMLFileLoader.java will save the selected mixers index into the file: configuration/ClientConfiguration.xml. All of the tips for manipulating Java Sound are contained in the file src/com/technogumbo/devices/SoundInputDeviceControl.java. // Setup a Line.Info instance specifically of the TargetDataLine class. I hope these samples will help you get off to a good start with Java Sound programming. If you happen to get an array out of bounds exception when running this, change the configuration file in configuration/ClientConfiguration.xml the node recordDeviceIndex to 0.